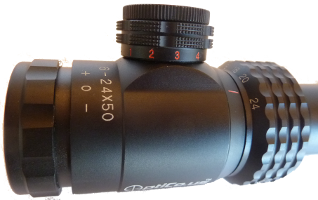 Beautiful clear optics with 50mm objective lens for fast target acquisition + long range spotting. 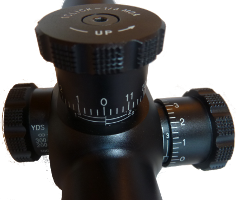 FOV at 100yds: @ 6x = 16.7 ft; @ 24x = 4.5 ft.
Illuminated Mil-Dot FFP reticle for precise ranging and accurate hold-offs when there isn’t time for Elevation MOA adjustment. Elevation Turret: 1/4 MOA Audible Click. 12 MOA/rev. Total adjustment at least 60 MOA. Recommend 10-15 MOA base. Flatter cartridges might be a few MOA short of zeroing with 20 MOA base. See FAQ. Windage Turret: 1/4 MOA Audible Click. 12 MOA/rev. Marked +/-6 MOA. Total adjustment at least 60 MOA. Pop-up lens covers + 4.25″ Sunshade included.